Last night I made a birthday card for my brother. This is my second shaker card and I must say I really enjoyed using this technique explained by Karen Day on Art Impressions' blog (click on the link for all the details). Very easy and so versatile, it works with so many dies. So I first cut out my frame out of a coca-cola box 4 times and one last time from a blue patterned paper. I kept the center of the blue die cut to use it as my shaker background. I stamped and embossed in white the music notes and my sentiment (Happy Birthday). I added the sequins and colored the hoot's hat with the same colors. As always, I added some Stickles on the hat. My card's background is made with a patterned paper and I glued on it a flower I cut out from another patterned paper. The hoot is mounted on 2D foam and on the frame. Voilà! Thanks for visiting my blog! Your comments are always appreciated! Such a great upcyle idea to give your card dimension! Love how you colored the little owl too. Thank you so much for playing along with us over at the Simon Says Stamp Monday Challenge Blog this week! Using a coke box is awesome. I was wondering what kind of thin cardboard I could cut. Thanks for the great demo! Thanks for the inspiration to try different shapes besides the traditional circle to make a shaker card. I will be needing to tackle one of these soon and you have made me excited to do so now! Yours came out so well! Love your owl image too! Thanks for playing along over at Seize the Birthday! 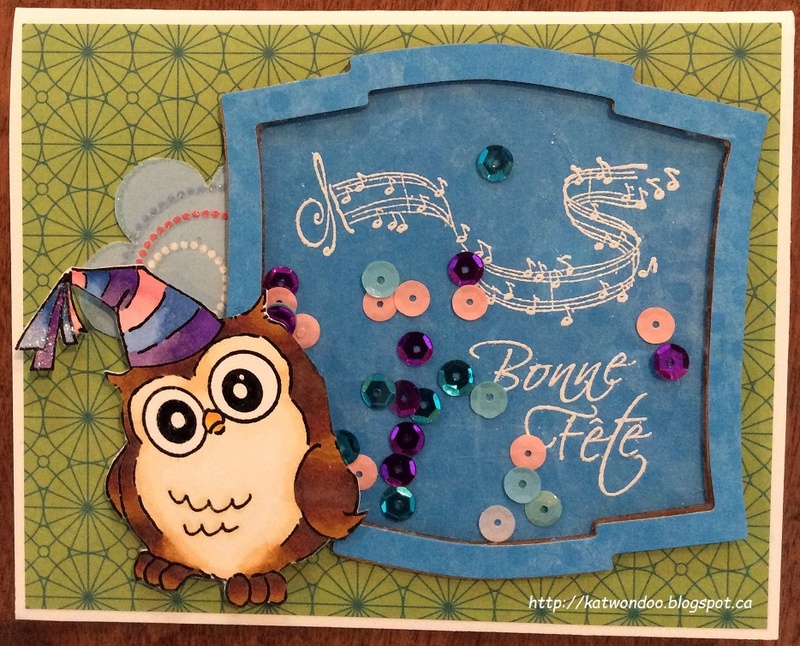 hello, super cute card, I adore the owl...sweet! so glad you played along with us at simon says stamp wednesday challenge! Adorable card. Love the cute owl and your shaker element is fabulous. Great way to recycle. Thanks for sharing with us at Seize the Birthday. Super cute!! And the shaker is awesome!! Thanks for playing with us at Art Impressions Challenge! !